Bastille Day in Paris is quite a celebration. The holiday commemorates the storming of Bastille and the release of its political prisoners on July 14th, 1789. It was the beginning of the French Revolution. It celebrates the end of the absolute monarchy of Louis the 16th and the eventual establishment of the first French Republic in 1792. Parisians today celebrate the day with parades, airshows, free admission to many public monuments, and a fabulous firework display. We arrived in Paris on the eve of Bastille Day, June 13th. It was a cool and damp morning when we arrived at the Charles de Gaulle Airport, collected our luggage, and found the taxi stand for the city. We were exhausted from the overnight flight, but in spite of the gloomy sky we were thrilled to be in Paris. As soon as we had unpacked and showered in our rented flat, we went out with our umbrellas to explore and enjoy our surroundings. Our temporary home was in the center of the Marais district which is in the center of the city. The gray skies did not dampen our enthusiasm and actually made buildings and colors seem to look more vivid and striking. We walked toward the Seine River and the Ile de la Cite. This is one of the two remaining natural islands in the Seine River in Paris as well as the medival city center and home of the famous Notre Dame Cathedral. We walked around the small island admiring the Cathedral from every angle, but did not go inside. Our explorations took us back across the bridge and toward the Place de la Bastille or the Bastille square. In the center of which stands the July Column which commemorates the historic event. As we approached the square and its wide roundabout we heard police sirens and noticed lots of police cars and patrolmen. These gendarmes were dressed in what appeared to be modern-day armor and they looked prepared for battle. The sight and sound alarmed us and woke us from our historical revelry to the current political tensions in the Middle East and here in Paris. We heard the mob before we saw them, but soon it became apparent that the Bastille was still a hotbed for political demonstrations. We stayed long enough to watch thousands of anti-Israel Palestinian supporters parade into the square and begin to climb the monument in its center. From a distance it looked like ants swarming an anthill. The protesters with megaphones shouted angry words into the crowd and many held up signs displaying their support of the Palestinian struggle. Although we did not witness any violence, the atmosphere was charged with tension. We did not stay to watch the outcome of the situation, but we did read of violent outbreaks. Apparently the protesters threw projectiles at the policemen who retaliated with tear gas. There was also word of Jews in that area being harassed and even held captive for hours in a synagogue. A little unsettled, we managed to make our way back through the streets to our apartment. Even though it was only a few blocks from all the commotion, people walked in and out of shops and cafes as though nothing out of the ordinary was happening. After dinner our jet lag kicked in and we could not fight the fatigue. Every concern melted away as we slipped out of consciousness. Bastille Day festivities in Paris begin in the early morning hours with a military parade – the largest in the world. We woke to the sound of jets flying overhead and ate much of our breakfast hanging out our windows looking at the airshow. Huge military airplanes, jets, and carriers circled the skies of Paris in formation. For those of us who didn’t make the 8am parade from the Arc de Triomphe down the Champs Elysees, this ‘parade en l’air’ made up for it. We spent the day ‘touristing’ – we walked back down to the river and this time we toured Notre Dame Cathedral as well as the St Chapelle Cathedral which houses 6400 square feet of Biblical stained glass images. In contrast, the Pompidou Plaza behind the Pompidou Modern Art Museum looks entirely of the 20th century with its exterior pipes and elevators and glass panels. The clientele are also markedly different. Young people relax around the fountain with picnics, strollers, and their dogs. Many burgeoning artists and craftsmen display their wares on blankets and scarves on the cement. We enjoyed the atmosphere as well as a late lunch of ham and cheese on a crusty baggette. The highlight of Bastille Day for us was a dinner cruise on the river Seine. The Bateaux Parisien had a glass dome that enabled us to see the sights on both sides of the river unimpeded. We were served a five course meal that ended with expresso and macaroons. The sky cleared and the setting of the sun from 8-10 pm made everything look surreal. We passed the Eiffle Tower, the Louvre, the Orsay Museum, and circled the Ile de la Cite and Notre Dame before heading back upriver. By 10:30 pm the band was playing and the boat docked opposite the Eiffle Tower. The firework display began at 11 pm and continued for over 30 minutes. The colorful explosions fell down upon the river like pixie dust. Everyone on the ship was captivated by the display. Even the servers stopped and took in the sight. Never before had I seen fireworks on such a grand scale. Fireworks shot out of the Tower in various patterns and at other times the Eiffle Tower simply twinkled blue and white. It was midnight before we disembarked from the boat and made our way back to the apartment. The streets were once again full of enthusiastic crowds, but this time there was a feeling of celebration and camaraderie. I imagine that those French revolutionaries experienced many of the same emotions we had on that original Bastille Day in 1789: exhilaration in the execution, fear at the onset of violence, and celebration at the fall of the empire. 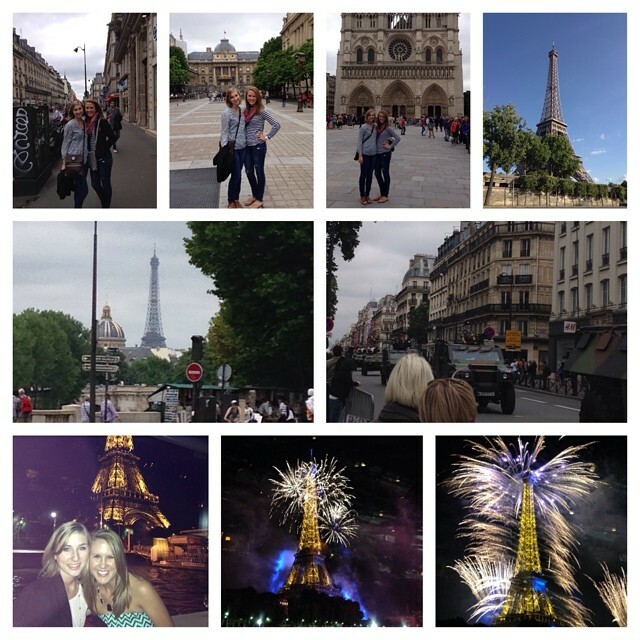 Surely, our family will never forget Bastille Day in Paris.